It's a beautiful paper and pairs well with the Rich Razzleberry and Old Olive. 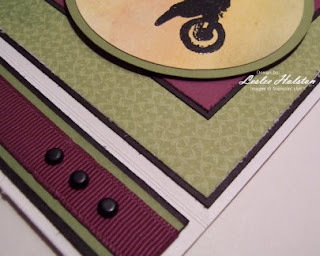 Since this card is for a young man, I placed three black brads in the Rich Razzleberry Polka Dot ribbon. That's right! Did you know that the backside of the SU! Polka Dot ribbons are plain? It makes this ribbon much more versatile in my book. I used my piercing tool to make the holes through the ribbon. The handheld hole punch has a tendency to pull the ribbon funny. 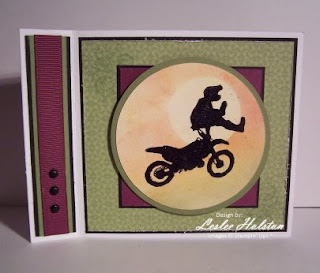 My boys both liked this card and, quite frankly, so do I. What do you think? Thanks for looking. And if you are looking for your mojo, head on over to the Mojo Monday Blog. That will get you headed in the right direction. Super idea to do the different fold. I didn't even think of that. Awesome job on the Mojo Monday sketch.